As most are aware, the Washington Post (WaPo) has become known as a major purveyor of climate fear mongering propaganda. And this recent article is a perfect example of their predilection to do so, especially in regards to human CO2 emissions and the very speculative catastrophic global warming climate change said emissions will have. Below is a quote from this article that exemplifies the propaganda that the world needs to drastically cut global emissions or ELSE. The article is mostly void of any facts but certainly has plenty of fringe green activist estimates, projections, speculations, and "expert" opinions masquerading as facts. Observed empirical climate evidence was not a mainstay of the article. One of their key "facts" presented at the beginning of the article is that global emissions for 2018 are projected to be 2.7% larger than 2017. Certainly sounds like an authoritative scientific fact until one reads much later in the article that maybe the 2018 emissions could be a much smaller global increase of only 1.8%. Then again, maybe the final number will be +1.5% or maybe even +1.2%. Truth be told, no one knows for sure what the real number is at this time, although a more accurate number will likely be known by mid-2019. Of course, the WaPo hopes that readers will walk away from this article with the thought that the estimated CO2 emission growth will lead to much higher CO2 atmospheric levels, thus resulting in the Earth suffering "calamitous" global warming outcomes. Their hope is that readers will simply believe and not bother to check or question the lack of factual evidence supporting the underlying causation assumption. When one does check the empirical evidence for the impact of annual CO2 emissions change on atmospheric CO2 levels an obvious disconnect becomes apparent - there is no significant impact of a specific percent increase in CO2 emissions and a subsequent percent increase in CO2 atmospheric levels (ppm). In fact, as the above chart reveals, the correlation between the annual % increase of CO2 emissions and annual % rise of CO2 atmospheric levels is a ridiculously low with a r2 of +0.002. That is basically zero over the 53-year time span from 1966 through 2018 (assuming the WaPo 2018 estimate of 2.7% is correct). The chart also depicts a declining linear trend for CO2 emissions while there is a slight increasing trend for CO2 levels, which is another indication that a positive correlation relationship between human emissions and CO2 levels is rather suspect. For the WaPo's climate fear mongering apostles and recent converts, the lack of correlation seriously undercuts their faith in the 'CO2 Control Knob' hypothesis of climate change: the dogmatic faith that government bureaucrats can just turn a dial knob that decreases CO2 emissions by a certain percentage; the result being that atmospheric CO2 levels will respond by a certain lower percentage increase; and thus the desired climate result being less global warming. If the "control knob" on CO2 emissions does not correlate at all with atmospheric CO2 levels, it's not very likely to correlate well with a specific percentage change in global temps. Again, how can this be if the control knob hypothesis relies on a strong change relationship between CO2 emissions and atmospheric CO2 levels? The empirical evidence does not lie, but since it is inconvenient, WaPo "journalists" just make it go away no matter the serious consequences. Just another case of those hated stubborn facts. Conclusion: Bad journalism combined with bad science will kill democracy from the baseless fear mongering. Note: Datasets used for Excel plots in above charts: CO2 tonne (metric ton) emissions and CO2 atmospheric levels. Link to research article on correlation between CO2 emissions and atmospheric CO2 levels (h/t Thongchai Thailand). ScienceFactCheck: Does Ocean Acidification Dissolve Starfish? A recent example of misreporting are the "scientific" news stories based on a study's press release that increased ocean acidification, presumably from human CO2 emissions, was dissolving the poor coastal starfish population. Turns out, per an analysis of what this latest starfish scientific study actually stated, the research said nothing of the sort. The news stories about the dissolving starfish represent reporting practice that is frequent and purposefully designed to mislead the public and policymakers. In contrast, when ocean acidification research is well-conducted and well-reported, the opposite conclusion about the impact of lower pH levels is usually the result. An example is a recent ocean acidfication study of the impact on a starfish relative, the lowly sea urchin. "In light of these several findings, the Australian, New Zealand and U.S. researchers felt safe in stating that the sea urchins "did not only persist but actually 'thrived' under extreme conditions." And why was this so? Uthicke et al. opine that it was because (6) "increased algal productivity under increased pCO2 [Ed: increasing water acidification] provided more food at the vent, resulting in higher growth rates." And in light of this likelihood, they conclude their paper by stating that the processes they studied "are best identified in natural settings ... where ecosystems and individuals are exposed throughout their life to conditions similar to those in future oceans."" Unfortunately, the journalistic practice of relying on questionable press releases is widespread, thus leading "journalists" to embellish and promulgate fake science and, of course, leading to ludicrous fear-mongering. The case of the "dissolving starfish" is a classic example. Previous articles about peer-reviewed science and articles about questionable journalism. The 2016 election Trump again reminded everyone that the vast majority of experts, pundits and journalists are not only terrible at short-term and long-term predictions, but also their failed prognostications usually, and directly, lead to public reactions that would not have occurred otherwise, such as the post-election anti-Trump riots. As the New York Post cover page shown on the left confirms, the public was completely mislead by the mainstream media regarding Hillary Clinton's supposedly massive soon-to-be landslide election over the hapless Trump. To compound the consensus expert election idiocy of 2016, many of the same "experts" then predicted that economic disaster would immediately follow this "unexpected" election of Trump. Here are the infamous Chuck Todd of NBC and Paul Krugman of the New York Times providing post-Trump election predictions that were completely without merit - literally, pure mainstream B.S. speculation posing as truth. Now please note the 5-year Dow Jones Industrial chart depicted above on the right, as of Friday, November 12. Because investors were pleased that Hillary Clinton lost, the market set new records over the 3 days immediately after the election. The Trump unexpected coattails obviously extended beyond just the large GOP gains across the nation from the November 8 election. Finally, because the experts and the media significantly misinformed the public constantly with Hillary-biased polls, combined with just plain ludicrous Trump fear-mongering, society's most gullible and misinformed Facebook generation went on a rampage with destructive and violent riots. Simply put, these millennial, anti-democratic terrorist riots, resulting in economic property damage and severely injured innocent bystanders, were directly initiated by false mainstream prophets and a compliant, Hillary-biased media. The moral of this story? The consensus experts, in almost every field, have an extremely high probability of being wrong, especially the ones pushing biased, agenda-driven doomsday scenarios and outcomes; and, the conclusion is indisputable: they should not be trusted at all by the public. The prediction failures regarding the Arctic polar region being ice-free, and the continuing good health and resilient, growing population of polar bears, just really grates on some science "journalists." "Up in the Arctic, things are getting slushy. But some polar bears are refusing to change their ways. Instead of compromising on where they spend their time, they’re clinging to the icy habitats they’ve always loved. As those habitats keep shrinking, though, the bears will eventually find things too crowded and uncomfortable to ignore." Buuuuut....it would seem those stubborn bears just keep ignoring their human scientific betters whom keep predicting the demise of polar bear species. “Polar bears are sticking to using the same type of habitat conditions even while sea ice disappears,” says lead author Ryan Wilson of the U.S. Fish and Wildlife Service. They still love regions with shallow water, a high but variable concentration of sea ice, and not much land-bound ice. He thinks that’s because—for now—they can still eat....So these polar bears seem to be doing fine without changing their habits." Buuuuut....just wait until next season warns the Discover Magazine's species helicopter-parent nanny. Remember this statement from climate alarmists over the last few years? 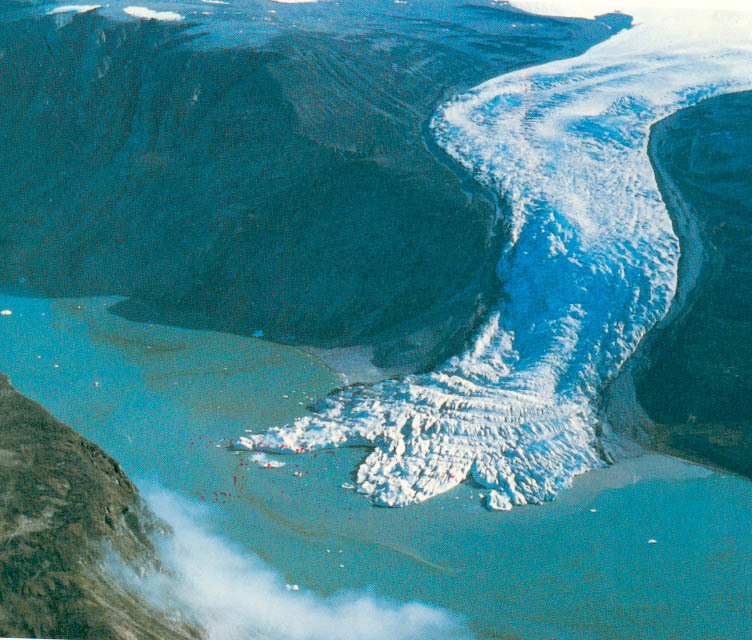 ===> "Global warming causes greater amounts of snow and cold for the U.S. due to the fact that the Arctic is melting." If that is true, then we should witness greater and greater amounts of snow accumulating across the continental U.S., year in, year out. Of course, in the first place, there is only flimsy weather conjecture behind the "Arctic ice melting causes more snow/cold in the continental U.S." statement - it's just another convenient excuse to blame global warming for any and all severe weather events. And as this map reveals, there is essentially zilch empirical evidence supporting that snow/cold excuse statement, despite the last two decades being marginally warmer. The climate reality is that almost all the original record-setting snow accumulations happened well before 1990. Well, the climate lies like this one are really easy to spout, which a compliant mainstream press then gleefully repeats, without even asking a single challenging question or doing any due diligence. This results in the public having a false impression that there must be scientific truth behind the claims, versus the anti-science speculative guessing the claims actually represent. Ultimately, these mistruths then mislead everyone about the climate science reality, with the empirical evidence being shunted to the side. The result? False science, and the ignorance of the climate data, leads to bad policy-making decisions and an immense wasting of valuable resources. And that's not good for the taxpaying public. List of severe-weather incidents, severe-weather graphs. U.S. and other regional temperature charts. h/t for map, Mike Smith, author and weather expert. 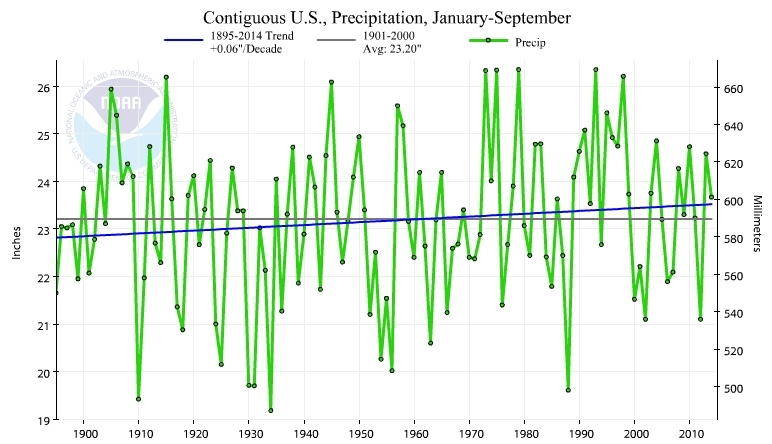 Per the Real Science climate site, this NOAA chart shows why the 'hottest-evah' did not happen in 2014. Simply, well over half of the U.S. experienced cooler temperatures than normal. And the warmer temperatures out west were more likely the result of an El Nino brewing than due to human CO2 emissions. As this map suggests, CO2-caused "global" warming is highly suspect since normal regional weather/climate oscillations easily overwhelm its impact. Original source of temp map. Additional regional and global temperature charts. Those stubborn, ugly facts of modern climate science, documented. Government climate research agencies, such as NOAA/NCDC and NASA/GISS, do not publicize the fact that they adjust historical temperatures on an almost monthly basis. They claim that their tampering with the actual historical evidence is "quality control". That's a blatant misdirection, as it is well understood by the people familiar with the situation that there is extreme pressure to report scary "global warming", so as to conform to the political agenda on climate change. Since May 2008, the web site www.climate4you.com has been tracking the NOAA "adjustments", using two specific months as an example (see accompanying chart). If there is zero to little global warming, then it is up to the bureaucrats to make it happen. The most brute force way to fabricate global warming is to adjust those monthly temperatures prior to 1950 downward; then adjust the post-1950 temperatures higher. Wonder of wonders, as the chart reveals, that's exactly what the bureaucrat-scientists did - to the tune of a whopping +2.2°C per century trend rate, in this specific case, since May 2008. Not so shabby, especially if they can keep that level of science hoaxdom up across all historical months going into the future. And America's worthless mainstream press goes right along with this fakery, with the sole goal of keeping the U.S. taxpayer in the dark to the benefit of politicians, their favorite greeny-crony capitalists and the 'at-the-public-trough' climate agencies. Today's Climate Denier-Liar-BSer: Does AP's Seth Borenstein Prove That The Pollutant CO2 Causes Bullshittingitis? Mainstream journalism continues in its death spiral as it loses public appeal, primarily due to biased "reporting" and outright misrepresentation about important policy debates. When the historians decades from now do an objective analysis of how American mainstream journalism self-destructed, classic examples to be studied will be the activist/advocacy science journalists who willfully ignore empirical evidence in order to push their preferred political agenda. The good news? The average American now pretty much ignores these bullsheeeeters. The Guardian has literally been at the forefront of pushing the unsubstantiated, fear-mongering meme that the current CO2 "caused" global warming was rapidly accelerating and dangerous to civilization's survival. As the adjacent suggests, The Guardian is finally coming clean with its readers and admitting that global warming is not really happening and a serious debate is presently taking place as to why. Good. The Guardian joins an ever growing list of mainstream press outlets and pro-alarmist warming web sites making the same forced admission - essentially, that global warming went AWOL.....ergo, it's not dangerous. This 'epic fail' is especially embarrassing since it is entirely due to the mainstream journalists doing nothing more than 'press release' science. Instead, if they analyzed the empirical evidence the way skeptical bloggers do, then the embarrassment would likely be less acute, or not even exist. Read here. Adjacent is a chart that depicts the output of climate alarmism of catastrophic global warming scientists, versus scientific reality. Per this empirical evidence, the experts and their wildly expensive, souped-up CAGW spreadsheet models obviously can't predict squat. Despite this well documented, spectacular and long known failure of the "consensus," "expert" climate models, the stuck-on-stupid tabloid press is just now coming to grips with their own spectacular stupidity (gullibility?). It would benefit all Americans, and the rest of the world's populace, if everyone just simply ignored the mainstream press in regards to any type of science reporting - if that were to happen, incredibly wasteful dumb policies would not be implemented by an even stupider class of individuals - the politicians. Additional stuck-on-stupid-journalism and climate-model postings. Climate-model and modern-temperature charts. U.S. Breadbasket At Risk From Global Cooling NOAA Indicates - Crop Failures, World Hunger A Result? There no longer is any serious debate of the non-existence of dangerous, accelerating global warming from human CO2 emissions - literally, from all current climate empirical evidence, it does not exist. Despite many climate scientists now being forced to reconsider their runaway "tipping point" AGW hypothesis of high climate sensitivity, and the U.S. public placing a theoretical climate change as a very low priority, there remain those political elites and mainstream "journalists" bitterly clinging to their blatantly incorrect, non-scientific, irrational (insane?) fears of "scary" global warming. In the scientific real world though, there is an abundance of peer reviewed, solid scientific evidence pointing conclusively to a future of both moderate temperature and climate change. As the above chart reveals, atmospheric CO2 levels have constantly increased since 1990 - see recent CO2 charts here. In contrast, the IPCC's gold-standard global dataset (above chart) confirms temperatures have stalled since 1998 - actually, they have slightly cooled at a -0.08 degrees/century trend. The chart's solid blue curve is a simple three year moving average of non-scary global temperature change that current political elites conveniently ignores and the MSM refuses to report. Current global temperatures are significantly below NASA's climate model and "expert" predictions - note the dotted red line on chart. All the major climate agency computer models, based on human CO2 emissions, have failed spectacularly. Modern weather disasters (e.g., blizzards, tropical storms, etc.) portrayed by political elites and MSM "reporters" as caused by "climate change" are the exactly the same bad weather disasters that took place during earlier periods of low atmospheric CO2. Read here. It is well known that climate doomsday journalists have a serious aversion to actual empirical evidence and ignore the overwhelming amount of new peer-reviewed studies that seriously challenge their anti-science, green-religion belief system about global warming. And now comes a new study by a huge international team of scientists, Niu et al, that points out an inconvenient scientific truth. The world's ecosystems (plants, animals and microbes) indeed prosper within warmer climate regimes - they successfully adapt and evolve with higher temps. 'C3' Conclusions: So, who you going to believe about global warming? The anti-science, lefty-loon doomsday fanatics like Al Gore and David Appell, or 68 expert scientists regarding thermal optimality and our favorite optimist, Bobby McFerrin? We conclude the latter group to be a better indication of climate reality and outlook. The green anti-science zealots really need to stop and smell the roses every once in a while, and be thankful how both life and climate have improved since the Little Ice Age - a suggested therapy for their miserable attitudes should include listening to "Don't Worry, Be Happy" at least 3 times per day, which will hopefully dull the catastrophic-fear paranoia edge they continuously live on. Despite the protestations of the climate doomsday scientists and their faithful cohorts (mindless parrots?) in the mainstream press, the extremely hot weather, in parts of the U.S., is an exception. Across the globe, reports of colder temperatures and cold inclement weather abound, which the large MSM outlets in the U.S. have failed to report. Because of the extreme one-sided reporting of the hot summer (ie, "global warming") in the U.S., most Americans remain ignorant of significant weather and climatic conditions across the world. This level of global ignorance is highly correlated to the god-awful, biased reporting done by the Seth Borensteins of the world. Freezing temps forecast for Oregon - In Summer! The UN's IPCC's Climategate scientists and the mainstream media have been at the forefront of a concerted effort to both mislead and frighten policymakers and the public about CO2 emissions and hypothetical catastrophic results from modern global warming. The perversion of climate science and the past complicity of the MSM in global warming alarmism propaganda is not only stunning but amazingly continues, despite all empirical evidence contrary to the fabricated alarmism. Click on the rightmost image and read what the mainstream press recently wrote, in reference to hysterical alarmism. Now read what really happened. The simple facts are, one cannot trust any science "reporting" done by the MSM, let alone its coverage of global warming. For actual global warming and climate change facts and objective analysis, the higher quality information sources are here. The leftmost image reveals the current condition of the modern "accelerating" global warming that both the IPCC and MSM claim is happening. This objective empirical evidence (from NASA / GISS - James Hansen's - climate research unit clearly indicates that over the last 15 years, through April 2012, that global warming is basically non-existent and that human CO2 has had little impact. Finally, the damning revelations grow in the case of the bogus 'hockey stick' science that was perpetrated by the IPCC and the MSM - that science being that modern warming was "unprecedented" versus prior historical periods. The middle chart now confirms that the perversion of climate science for the glory of global warming alarmism was recklessly pursued, which is unequivocally corroborated by this newest evidence. Past historical temperature charts. Conclusion: Global warming science facts have completely demolished the lies, myths and hysteria of the IPCC and the MSM. Yet, despite the overwhelming evidence, these "institutions" don't falter in their pursuit of a political agenda based on falsehoods. For an expanding cornucopia of reasons, no longer does either institution deserve the belief or trust of the public. Runaway Greenhouse Effect Facts: NASA's "Boiling Oceans" Prediction Not Supported By Data - Is Hansen Crazy? Look closely at the above - this is what "boiling" oceans look like after some 1.3 trillion tons of CO2 emissions poured into the atmosphere since 1850. As this tropical island paradise indicates, the long held belief of CO2 caused global warming is not supported by the tropic's data in the least, let alone supporting NASA's Hansen's recent crazy prediction of boiling oceans. At the 2:12 minute mark of this recent video, Hansen does his crazy "boiling ocean" hype - it's a total disregard of facts and plausibility. Despite this craziness, there are scads of American coastal elites and lazy (stupid? gullible?) mainstream media types that buy into Hansen's ludicrous, catastrophic warming "science" predictions. Still think there are runaway greenhouse effect facts that would lend credence to boiling oceans? Think again - expert tropical sea temperature measurements are conclusive - it ain't happening. The Cook Island sea surface temperature data are another factual reality check - the tipping point of runaway global warming is not taking place and, without question, should be heavily ridiculed by all the legitimate science community and an objective press as the bogus scare hype it represents. Runaway greenhouse effect facts: "Tipping point" global warming is not supported by the evidence; it's not even remotely plausible per the empirical data from the tropics; the world is not going to end from human-caused boiling oceans; and, NASA's James Hansen is possibly crazy, with fame, fortune and the drooling love of the MSM press lapdogs. Previous ocean-warming, tipping-point-hysteria and mainstream-media postings. 'C3' temperature-climate charts. Note: Black dots in both charts above represent monthly CO2 levels. Sea surface temperatures plotted represent the longest continuous monthly measurements (without any monthly gaps) for both island locations. Read here. The 'Real Climate' scientists are basically playing a shell game with James Fallow, where apparently the pea is Fallow's brain - guess where your brain is James? These scientists found an old 1981 paper that James Hansen authored containing computer model predictions about global warming. They then pulled an ancient chart from the paper and doctored it up, which the Atlanic Monthly's Fallows obviously didn't look too closely at (the leftmost chart above), nor did he bother to compare with more recent climate model output. The first problem with that chart is that the actual observed temperatures that Hansen plotted (black dots) are not the same as the red line temperature values that the "Real" Climate scientists used. For good subterfuge reasons, these "scientists" covered up (replaced?) Hansen's actual temps with fabricated temps - jeeez...somehow they forgot to point that out to the liberal media and Fallows. Hmmm...I wonder why? The middle chart highlights the temp trough (1966, denoted by gold circle, gold arrow and red dotted line) of the observed temperatures that Hansen used in 1981. Soooo...the actual temperatures were covered up with replacements to make Hansen predictions look better - doh! The second major issue with this chart is that alarmists claim that human CO2 has impacted the climate and global temperatures prior to 1980. The "Real" Climate scientists are using an old Hansen chart that shows no differing impact until 1990 - not even climate skeptics would produce something this egregiously wrong. The rightmost chart represents the Hansen models as of 1988, which he used for his famous 1988 Congressional performance testimony. Reviewing the 1988 model output of that same chart, it is clear Hansen felt that CO2 was impacting climate well before 1990. Also, the predictions of Hansen's 1981 chart are not in sync with the output from the later models. Year 1980 is a prime example of this disconnect. Going back to the middle chart, the old model prediction for 1980 (gold circle, gold arrow and blue dotted line) is significantly below the prediction of the 1988 computer model output (the blue circle and blue arrow). Look closely at that chart on the right again. The green curve is James Hansen's prediction of global temperatures if the world did not agree to strict CO2 emission reductions. In fact, the world has thumbed its collective noses at the CO2 restrictions and Hansen. End result? Real world global temperatures are well below the infamous Hansen predictions that are his typical alarmist hysteria. BTW, the prediction for 2011 is highlighted with a blue circle, and the real NASA/GISS and HadCRUT 2011 temperatures are represented by those much lower black and red dots, respectively. As the above articulates, the 1981 predictions by Hansen were later supplanted by Hansen's newer model predictions from his 1988 Congressional testimony. In essence, Hansen turned his back on the old predictions (but just recently resurrected by others, not Hansen). Since the late-1980's, Hansen's global warming predictions, associated with 'business as usual' CO2 emissions (the green curve on rightmost chart above), have done poorly versus the climate reality. The fact that James Fallow fell for such an obvious con game by the climate "scientists" is of no real surprise - the liberal / left old school media are really at a near loss challenging this level of bogus science. Conclusion: Reading Fallows' anti-science, liberal media spin can't make one feel good about the current state of the media press; nor good about our taxpayer funded scientists putting out Fakegate-style fraud. It's a sad state of affairs, which Fallows et al. makes worse. Previous climate-model and mainstream-media postings. The 'C3' universe of charts. Read here. The IPCC continues to push the bogus claim that "global warming" (supposedly due to human CO2) is (and will) causing more severe weather events with the publication of their new 'SREX' report. The adjacent violent tornado chart is a clear cut example that alarmist claims of more severe weather due to warming is indeed not factual. Previous severe-weather postings and charts. Actual list of severe weather events. First, as the adjacent chart reveals, U.S. temperatures are not "accelerating." The red curve is the 12-month moving average (since 1895), which clearly shows no acceleration, and shows zero relationship to the growing levels of atmospheric CO2 levels (black dots). As can be seen, U.S. monthly temperatures have a wide variation (the blue up/down plot) in any given year, fluctuating between low and high extremes. Read here. This second chart plots the total number of severe tornadoes (F2, F3, F4 & F5) in decade groups (the 2000's include 2011). This actual empirical evidence substantiates that severe weather events, as represented by extreme tornadoes, are not increasing in the U.S. Conclusion: The mainstream press (eg., NYT, WaPo, Time, CBS, NBC, LA Times, etc.) willfully and unequivocally reports misinformation regarding severe weather and global warming. They do so to purposefully mislead the public and policymakers regarding global warming and climate change. Previous severe-weather postings. Modern temperatures and severe-weather charts. Bill Nye: Liar Extraordinaire, Scientific Illiterate or Climate Change Charlatan? Or, Just An Incompetent Bozo? Read here. Is it any wonder that the liberal/left/progressive/Democrat political spectrum is falling out of favor with the public when there are clowns like Nye, Masters, McKibben, Gore and others pushing their anti-science and anti-prosperity agendas. Dr. Ryan Maue does an excellent fisking of Bill Nye's TV performance/science regarding Hurricane Irene. It's not pretty. "But Bill Nye takes the “anti-science” crusade to a new level by showing up on Fox Business...and embarrassing the hell out of himself. Once you watch the video and read the transcript, you will be left in amazement at his utter lack of comprehension of the topic at hand on national television!...The left actually thinks Bill Nye is a brilliant ambassador for their brand of global warming alarmism — a legitimate guy that understands the science and can articulate an explanation. However, Nye has no credentials or expertise with respect to global warming and hurricanes, at all. Not one iota." Read here. (h/t Tom Nelson) The green left/liberal/progressive bias of the mainstream press is certainly amazing, blatant and astoundingly bad. The MSM, led by the Times, will stoop sooo low that they even will praise dictatorial tyrants because a family member says the politically correct words about global warming. "“Climate change is a global problem, but global solutions start with local solutions,” he said in faintly accented English. Societies, he said, should be built in a way that allowed them to reduce greenhouse gases. “The day will come when oil will run out, and if we wait for that it will be too late,” he said. The man — part scholar, part monk, part model, part policy wonk — was Saif al-Islam el-Qaddafi, the powerful 33-year-old son of Libya’s extroverted and impulsive president, Col. Muammar el-Qaddafi."" Is It "Fleeing Species" From Global Warming? Or, Is It "Fleeing Journalists" From Objective Science Reporting? Read here. The news media this past week made a huge to-do of a new study claiming that species across the world were fleeing geographical locations due global warming. While immediately trumpeting this story as new and significant, the actual truth indicates this study is just warmed-up, leftover garbage from a previous study by the same "scientist." As the story indicates, again it's the blogger community that is doing the investigative reporting because the mainstream press is either to lazy and/or stupid - in essence, the MSM continues to publish climate change "science" garbage without any fact checking. Mainstream Media Headline Likely To Be A Lie: "Polar bears drown as ice shelf melts"
Read here and here. (h/t Tom Nelson) The climate alarmist science fiasco continues. Turns out the empirical evidence backing the peer-reviewed claim that polar bars are drowning because of lack of ice turns out to be non-existent. Now that the truth about polar bears is coming to the forefront, the mainstream press is not too interested in the story. Although the mainstream press is not the least interested in the actual scientific merits of any climate issue, they are certainly quick to push on the public the unsubstantiated disaster hyperbole that is fabricated by needy climate scientists. The meme of the "polar bears are drowning" is a classic example of worthless journalism and shoddy, climate alarmist science. "Drowned polar bears have not been reported by other scientists, but the hypothesis that a long search for sea ice makes it more likely that bears will get caught in stormy weather and drown is regarded as plausible." Unfortunately, for the public, this science journal and the mainstream press now almost exclusively rely on "plausible" and pure speculations by scientists who are seeking new funding for their research. For these "elites," opinions, not facts, are the new coin of the scientific realm. Hey, why bother with the expense of empirical evidence when one can fabricate "science" and get it published by the media hystericals? Note: Do you read Nature or Science? Don't bother to waste your time unless you think there is value from "press release science." Because of green/left/liberal political agendas, truth and objectivity often gets smothered by these publications. Read here. Both the New York Times and Washington Post have seen their daily reporting essentially become shrill propaganda pieces, pushing the latest left/liberal/Democrat partisan agenda, no matter how unprofessional and idiotic. Unfortunately for the public, this same mindset, plus a dose of significant anti-science attitudes, has invaded their science reporting also. Latest example is Justin Gillis' ("I-hate-real-data") article on global warming and food production. "Today's New York Times has an article by Justin Gillis on global food production that strains itself to the breaking point to make a story fit a narrative. The narrative, of course, is that climate change "is helping to destabilize the food system." The problem with the article is that the data that it presents don't support this narrative...But this claim of slowing output is shown to be completely false...Far from slowing, farm output has increased dramatically over the past half-century and on a per capita basis in 2009 was higher than at any point since the early 1980s...Completely unmentioned are the many (most?) scientists who believe that evidence is lacking to connect recent floods and heat waves to "human-induced global warming." In fact, the balance of evidence with respect to floods is decidedly contrary to the assertion in the article, and recent heat wave attribution is at best contested. More importantly, even in the face of periodic weather extremes, food prices -- which link supply and demand -- exhibit a long-term downward trend, despite recent spikes...Even the experts that Gillis cites don't really support the central thesis of the article." In conclusion, this NYT's article is another example of fraudulent science reporting by the Times, which is entirely indicative of their partisan, left/liberal propaganda approach to modern "journalism" (honestly, is it a surprise to anyone that their readership has cratered over the past 10 years?). In addition, most scientists now believe that Justin Gillis is incapable of accurate science reporting and is too dumb to be connecting the dots of the "evil global warming" scare-mongering. Update: Another NYT's anti-science column re: global warming.